Data access services via data virtualization provide important abstraction and decoupling features. Decoupling is the key concept in services and is achieved through abstraction based on service interfaces. Business processes represent a formalized executable form of the actual enterprise’s processes, but offer a layer of abstraction above the physical processes, be they automated or manual. Business processes are composed of business services. Just as business processes represent an abstraction from their real-world counterparts, so do business services offer an abstraction of actual physical services. Business processes and services both make use of business information, which is likely resident in many different types and instances of databases and files. 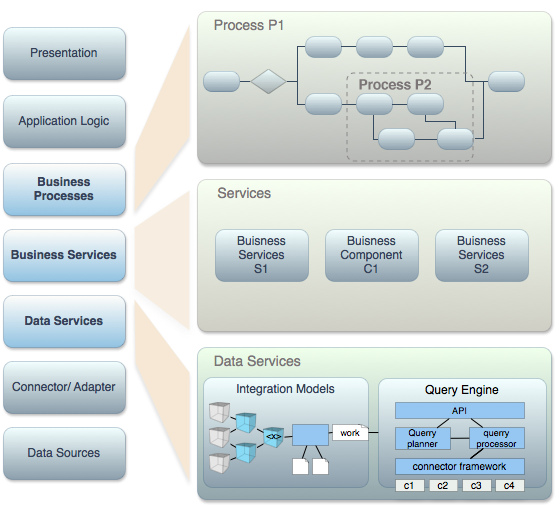 This information can be exposed to business services using the same service-oriented paradigm - as data access services. A data access service is a standards-based, uniform means of accessing information in a form useful to business applications. Data access services expose information to business services in a form and through a standards based interface amenable to those services. The form is generally some representation of business objects to be manipulated by business services and passed between services by business processes. Business objects may be simple tabular structures or complex nested structures. Almost always, though, they must be composed from information residing in more than one data source, often in different persistence formats. * **Modeling environment**, to define the abstraction layers -- views and Web services * **Execution environment**, to actualize the abstract structures from the underlying data, and expose them through standard APIs. A query engine is a required part of the execution environment, to optimally federate data from multiple disparate sources. Data access services can be viewed from both a technology vantage point, or from a business viewpoint. A more business or user-centric view of data services is that they are information representations required by business applications. From this perspective, data services are defined and designed by business analysts, modelers, and developers to represent the information structures required by business applications. Often, a key design goal is one of interoperability - the requirement that systems work together seamlessly, including when exchanging data. Teiid provides graphical and other tools for defining these interoperable data services, essentially relational and XML views that can be used by business applications in a semantically-meaningful manner.